The Lister Limestone and Travertine fireplace, made of quality Portuguese limestone with contrasting travertine stone slips, would make a wonderful addition to any property’s living area, new or old. The clean lines and sleek shape of its design allow it to stand out as a sophisticated piece. This version of the Lister is available with twin halogen recessed downlights as an optional upgrade for no additional cost. Its beauty and elegance will provide comfort and warmth to your family for many years in the future. Standing tall at a height of 1100 mm (43 inches) with a mantle that spans 1320 mm (52 inches), the Lister is constructed from the highest quality limestone and travertine stone. An alternative interior add-on consisting of a 5-piece limestone chamber is available for an additional cost. Its optional recessed lighting along with the beautiful step design will add a touch of sophistication to any sitting area within your home. This version of the Lister is available with the option of easy financing through the “pay 4 later” program, allowing you to make easy monthly payments. 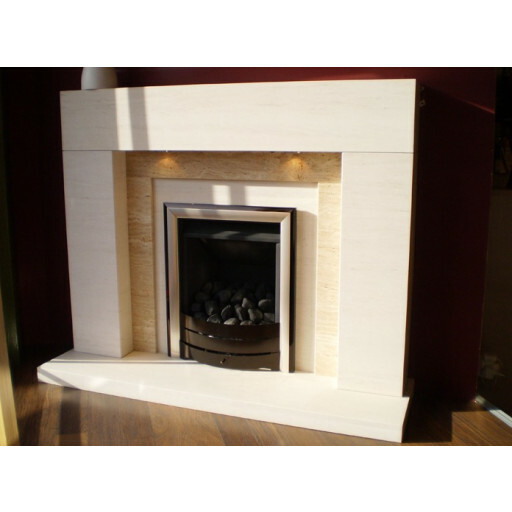 Purchase of the Lister Limestone and Travertine fireplace includes free delivery to the mainland UK and includes a 1-year warranty. I would like to thank the sales assistant who served me at the fireplace warehouse on accrington road in Burnley when i visited the store to choose my new fireplace - the Lister art deco style fireplace in limestone with travertine slips and down lights which I have just had fitted and it looks amazing in my living room.